A couple of my clients have asked me how to access the synonym mentioned by a user when working with the IBM Watson Conversation service. Accessing the matching entity is well documented but it wasn’t apparent how to get the actual word or words mentioned by the user that the entity was matched on. Having asked the question internally and received the answer I thought I would share in lieu of the documentation being updated. The answer is actually in the documentation here but without explanation so my clients and I missed it. 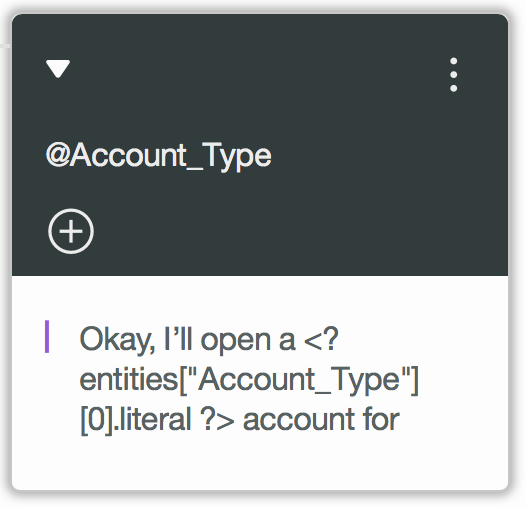 Okay, I’ll open a <?entities["Account_Type"].literal ?> for you now. The result will now be that the placeholder is replaced with the word “basic”. This entry was posted in Technical and tagged Chatbots, Cognitive Computing, IBM Watson, Watson Conversations on October 21, 2016 by Olly Cox. I’ll assume that if I wanted to display the second synonym in the list, that I would use rather than ? 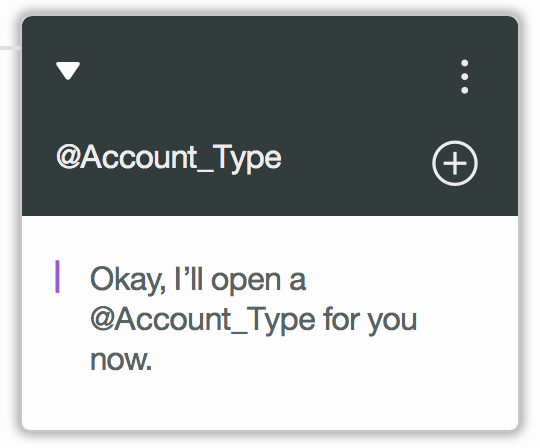 If you’re expecting two entities of the same type then you’d use entities["Account_Type"] to access the synonym of the second entity.